Selling Points: Slam Dunk is 22 years old. Let that soak in for a moment. Takehiko Inoue wrote what many consider to be the best sports manga in Japan 22 years ago. Since then, Inoue has been an energetic ambassador to the sport, even going so far to write two other basketball stories, but neither Buzzer Beater or Real (or other shows like Dear Boys, Ahiru no Sora, and Cross Game, really) has captured the attention of basketball like Slam Dunk did. Perhaps it takes more than just five players to make a good basketball show, and in the case of Kuroko's Basketball (Kuroko no Basuke), the latest sports manga from Shônen Jump to make it to the pros, it takes a sixth man. Actually, no one really knew about that "sixth man", as Teikô Middle School was known in Japan for having the most solid team in the country with its starting line-up, the "Generation of Miracles". Once graduation came, the players split up to join different high-school teams, some of them known for their dominance. Seirin Private High-School's team isn't one of them—they're only in their second year of existence, but they managed to do well their first year. Their second year appears to have a sudden boost in confidence, as flame-haired Taiga, an aggressive offensive specialist returning from America, wants nothing than to be the best player in Japan. The eagle-eyed coach for Seirin, second-year student Riko Aida, can see his talents like Vegeta sees power levels (IT'S OVER NINE THOUSAND!). So why is it that she (and practically everyone else) barely notice the quiet-toned Tetsuya Kuroko when he says he wants to join the team? While Kuroko isn't laughed off the squad, many don't believe that a kid with his scrawny build and lack of presence was on Teikô's legendary team. Taiga brashly chides Kuroko after a pick-up game for his absence of skill, only for Kuroko to placidly tell Taiga he will make him the best player in Japan. Suddenly, passes in practice and scrimmages veer off at odd angles, and balls are swiped away on defense—apparently Kuroko's so invisible that he's perfected the art of misdirection and defense! 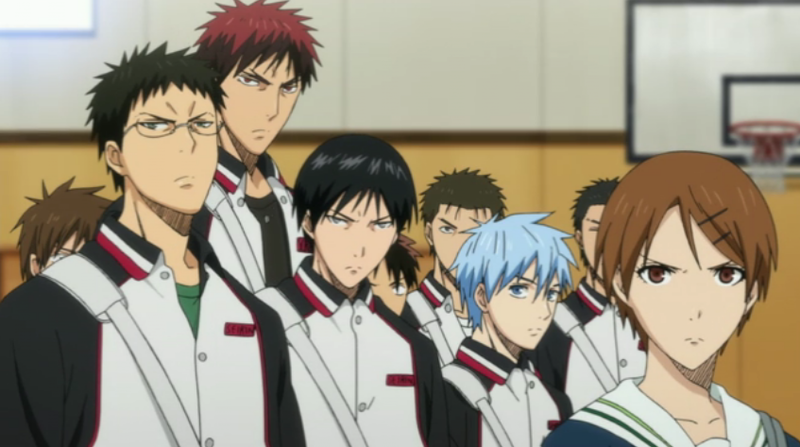 And so the journey begins with an unheralded team and an unknown legend, as Seirin looks to climb the ladder of success while Kuroko attempts to best his former teammates. 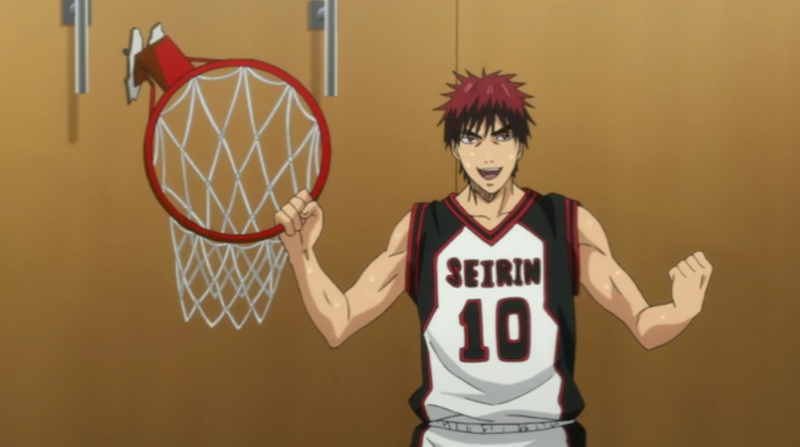 Just how high can he lift Taiga and his team to the championship? Actually, let me rephrase that—I dislike what basketball has become. While I will pick up a basketball and play a game of H-O-R-S-E with myself every now and then, ever since senior year of high school, back when the most talented kid on our team quit in a blaze of narcissism out of protest for not instantly being put on the starting lineup, I hate how basketball has drawn the biggest egos to prominence. That's likely why I admit I had no real fondness towards Slam Dunk—it debuted when I lost my love for basketball. Using that bias, I probably would have thought the same about Kuroko's Basketball, but the idea of the sixth man rising above the starting lineup is something I have been waiting to see in sports anime and manga. I didn't feel that challenge in sports shows like Eyeshield 21, Major, or even Captain Tsubasa. 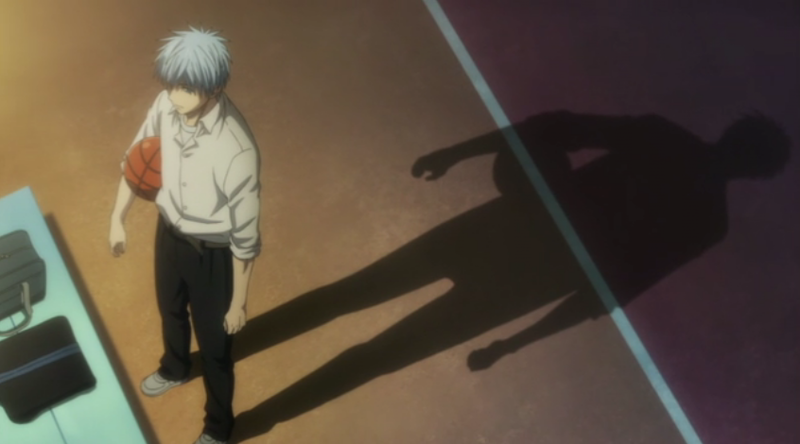 Perhaps Mr. Fullswing might have been close, but seeing Kuroko as an adhesive and not merely a large piece of the puzzle actually made me excited to watch the show. It's this challenge of taking down the "Generation of Miracles" one team at a time that really makes this show entirely predictable, but also rewarding to watch. While the show is meant to have all that athletic drama and about as many hard-to-believe moves as a Prince of Tennis game, it's actually great to see a team—that is, a starting five and a full bench—getting deserved attention. Frame it with the sudden bursts of comedy from Taiga's fiery emotions and Kuroko's stunted personality, as well as improvements to the original artwork by Production I.G., and this show actually produces interest on and off the court. Final Decision: Sadly, this is a sports anime, which means that the outcome is likely scripted with very few surprises. While it's great to see Seirin thrive in such a short amount of time together, it's just another story of a powerhouse disguised as a weaker team. Each game will introduce another color of the "Generation of Miracles", each of them looking down at Kuroko like a vermin, only for Kuroko's ball-handling and Taiga's strength to spark the upset. That's not exactly a bad thing, but it only means that surprises would have to come from miraculous half-court shots or ten-second plays that take four hours to develop. The scary thing to expect from Kuroko's Basketball is that it just might become the basketball version of the previously-mentioned Prince of Tennis. Hopefully, this show doesn't become a popularity contest between the characters and have the players shout their gifted moves in the air like a conceited "And-1" mix-tape. Hopefully, egos can be put in check to make Seirin feel like a unit and not merely a Miami Heat clone. That being said, Kuroko's Basketball is likely the first this season that I might regret seeing leave the competition. I can't exactly compare it to Slam Dunk, but if we can get some good production from director Shunsuke Tada and scriptwriter Noboru Takagi (Durarara! !, [C]), perhaps we might have a show that can stand up as Shônen Jump's sixth man? Next Week: Anime Survivor is reduced to the Championship Round!